Just as we reach our one in eight games point (awesome! ), we thought about doing a proper classic. 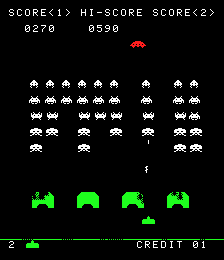 And as far as imagery go, you can’t get much more classic than Space Invaders and its aliens. A type of classic imagery that has, in fact, been showing up in cities around the world. Space Invaders itself, in the mean time, is the now classic story. Aliens are invading. You shoot them with your little ship thing. Kill them all before they kill you. I know it sounds cliched (and really, it is) but as this was one of the first games, if not the first of its kind, to do it, it works. This is one of those games everyone knows… what can we say about it? Let’s just say that if you haven’t played it yet, find one of the many clones out there and give it a go. For those of you who are regulars on Neopets they have a clone of it known as Swarm. Space Invaders is, in the basics, a simple shoot ’em up. There’s only left and right movement and you fight the aliens, each of which dies in one hit. There’s a couple of towers to defend you from the incoming fire from the aliens. This simple gameplay, as with many of this era, is addictive, for a large part because of that same simplicity. There’s a simple satisfaction from killing the aliens and, more important, there’s real tension as the aliens slowly creep forward towards your ship, an unrelenting march forward that gets your heart racing as you try to defend yourself. Very real and frightening. This combines with memorable graphics. Yeah, the aliens are pixelated and simple, but are alien and scary – not nightmare territory, but weird and strange enough. And as said, now iconic enough to matter. What is interesting is that this could be one of the first games to be flogged to death with many ports, sequels and soft drink related spin-offs. It also inspired many revamps during the naughties which, like those for Pac-Man, include some titles so successful that they have made it to the list itself. With these early games, there’s little to say. Yeah, things have moved on, they look fancier, but to be honest, not always as effective. Because of the time when this was made, they had little choice – only the core elements had to be in, and they had to work. And that’s what they do. Sorry for the short write up folks but it is really hard to come up with things that have yet to be said about this cultural icon. I mean this is a game so iconic that it was chosen to grace the front of the book itself! As mentioned earlier we will back to the Space Invaders formula with the two portable console revamps so here’s hopeing we have more to say then.